With the end of 2016 nearly here, we wanted to say thank you to all our blog readers, customers and partners for making this Creative Virtual’s best year yet! It’s been an exciting year for us and the customer service space with a renewed interest in chatbots and virtual agents. From the addition of two new products to our suite of Smart Help solutions to being recognised by The Wharf Innovation in Business Awards to attending a record number of industry events around the world, 2016 has been a year to remember. 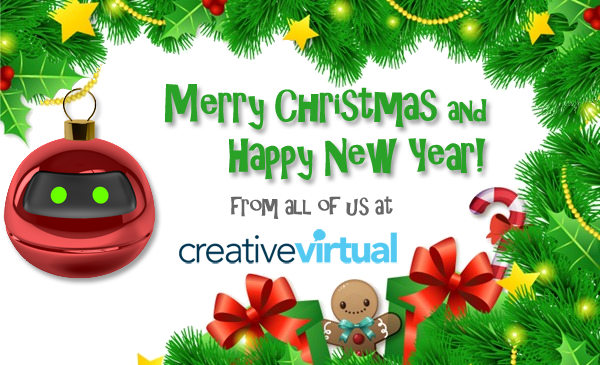 On behalf of the entire Creative Virtual team around the globe, we wish each and every one of you a very Merry Christmas and a Happy New Year! https://www.creativevirtual.com/wp-content/uploads/2016/12/Xmas-2016.png 365 600 Mandy Reed https://www.creativevirtual.com/wp-content/uploads/2017/12/site-logo.png Mandy Reed2016-12-21 12:52:312018-05-18 17:14:54Merry Christmas and Happy New Year!